Apex Legends is set on a futuristic map full of mountains, rivers, and clusters of buildings. There’s a backstory featuring a world of mercenaries and outlaws and the “Apex Games,” the battle royale that 20 squads of three take part in. While the story adds color to the characters and facilitates the presence of an in-game announcer, the basics are like any other battle royale: You and and your squad drop into a map (the currently only available map is called Kings Canyon, though more may be added in the future according to the game’s FAQ), scrounge up all the weapons you can, and try to eliminate other teams as a damage-dealing ring steadily closes in. Apex Legends diverges from battle royale heavyweights PUBG and Fortnite by offering a playable roster that’s more akin to what you’d find in a hero shooter like Overwatch. Characters (here called Legends) include the likes of a robot scout called Pathfinder, a hulking heavy known as Gibraltar, and a skirmisher named Wraith who is surrounded by interdimensional sparks. They play different roles, like stealth, healer, or scout. In addition to a special passive ability, Legends have a tactical move and an ultimate, both on cooldowns. As a lifelong support player, I enjoyed playing as Lifeline, the medic whose tactical move launches a healing drone and whose ultimate calls down a supply drop of shields and other defense gear. Other characters can queue up airstrikes, see hints of where other players have been, or create ziplines. As players grow more familiar with the game and its characters, I’m sure interesting strategies will emerge around the combinations. For now, it’s just fun to see what everyone could do. After you choose your character, you’re shown the identity of the upcoming match’s “champion,” a higher-ranking opponent who rewards you with more experience points if you kill them. Their image, along with the player in the match with the most kills, are projected on screens around the world. It’s tough to say what this adds to a game where it’s hard to find, much less identify, a specific player. It’s also unclear whether a match’s champion deserves that honor. In one match, I was thoroughly carried by my more-skilled teammates, but I killed the champion in a firefight and we went on to win. I became champion in my next match, and it was terrifying to know every other player now had a target out for me—but that terror quickly waned when I remembered that’s the crux of the battle royale genre itself. I was promptly killed in a busy drop zone and moved on with my life. It feels like a lot of affectation, especially given my preference for the hands-off nature of PUBG’s world, or Fortnite’s unexplained cartooniness. Apex Legends’ other new twists on the battle royale genre impressed me more. Instead of leaping from the dropship into the map as you please, one player is randomly appointed the “jumpmaster,” deciding where the squad will land. You can pass off this duty - in one game I played with Kotaku contributor Zack Zwiezen, my squad passed the jumpmaster role among us like a game of Hot Potato. Once you’re running around in the map, you can communicate over voice, but also by pinging locations, enemies, and loot with a button press. In the matches I played with strangers this was immensely useful, and even after I ran out of ammo I was still able to target enemies for my squadmates. The game’s other twist, which is my favorite so far, is its revive mechanic. When you die, your squad has a certain amount of time to get to you and revive you. If they don’t make it in time, they can still collect your “banner,” a customizable image that represents your character. At any point during the match they can run to a respawn beacon and insert your banner, which will respawn you in a dropship so you can rejoin the game. There’s a risk to this - using the beacon takes time and leaves you exposed - but it’s a clever step beyond the standard respawn. In one match I was killed almost immediately when I couldn't find a weapon in an active drop point. My teammate couldn't reach me during the respawn window, but waited until the area calmed down to retrieve my banner and revive me. In the matches I played, people took advantage of this mechanic more often than not, and it was an added incentive to stick around in a match after I died. Racing toward a respawn beacon with my teammate’s banner. My deaths came, as they do in many battle royales, either almost immediately or in the late game. My success felt dependent on where I dropped into the map. I learned it was better at least on day one, to drop on the map’s forested outskirts or in a crumbling city later along the dropship's route. I died a lot simply by landing in too-crowded areas and not snatching up a gun in time. If my squad had a quiet drop, we were able to last pretty long looting our way across the map. 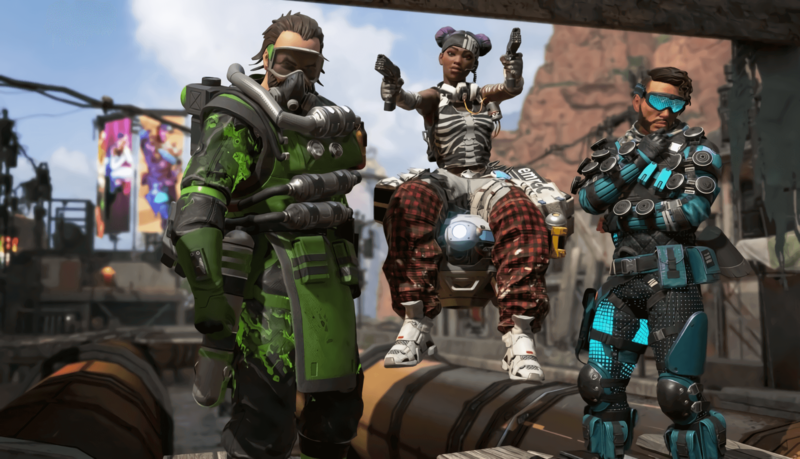 The community is still finding its footing in Apex Legends, and it’s exciting to see what the game will become. The roadmap suggests seasons and a battle pass. There’s already a store full of currency, cosmetics, and loot boxes called Apex packs that advertise their loot percentages before you open them. As the game goes on, I’m sure we’ll see people customizing their characters, finding favorite skins and voice lines, and creating a meta through different squad combinations. For now, Apex Legends can feel cluttered, but, at its core, it’s a lot of fun.